Greg Norman knows all about life at the top - he was world No 1 for 331 weeks in his career. And while he might not have won more majors that Rory McIlroy, ending up stuck on “just” two despite his talent, he can still teach the Holywood star a thing or two. As McIlroy slammed the door shut on 2013, complaining that “scrutiny and critcism” of his golf game might be fair enough but digging into his private life was out of bounds, Norman reminded anyone hoping to reach the top of the game that you must put up with the spotlight 24 hours a day. In an in-depth interview with Golf.com, Norman said: “Golf teaches you about who you are - how you deal with failure, how you deal with success, how you deal with humility, how you deal with the public. Most people fail in at least a few areas, so you’ve got to work at it. I certainly had to. McIlroy quit at least once on the golf course this year - perhaps more. And yet in blaming media intrusion into his life for adding to his woes, he’s setting a dangerous precedent. A quick look though his twitter time-line is a window into his relationship with Wozniacki that he willingly offered the world. Having fed the monster himself, it’s ironic that he should complain about its voracious appetite for more. Norman also pointed out that he does not believe for one second that McIlroy’s woes this year had anything to do with equiment, which is something that McIroy himself has always maintained. It was no surprise then when McIlroy pointed to what he felt was excessive interest in his bust up with Horizon Sports Management and his relationship with Wozniacki. If the Horizon problem was a distraction, it was only natural to expect that press speculation - fuelled by the 24/7 grind of the rumour mill - would grow in relation to estimating the level of sweetness and light in his romantic life. Give the ups and downs he experiences in his mood and with his game, it’s little wonder that the “chatter” about his private life also grew in volume. It took Norman until he was 31 to win his first major and until he was 38 to win two. 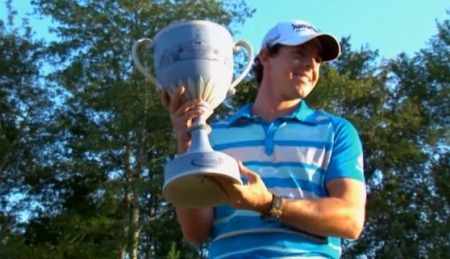 McIlroy was just 23 when he won his second Grand Slam title. He still has time on his side as he battles to combine the responsibility being a global icon for Nike - something he felt he would never achieve with Chubby Chandler as he his manager - with being a 20-something kid for Co Down with more money than Croesus. While his father Gerry and the new CEO of his management company Rory McIlroy Inc, Donal Casey, might have those physical qualities in abundance, one has to wonder if an experienced hand, wise in the ways of the high-powered sports/business worlds, might not have an avuncular role to play. McIlroy has always been a prodigy with a golf club in his hand. The rest is as new to him as it would be to any other young man with his background. Given his comments at Tiger Woods’ end of season event in California, McIlroy appears to have realised that he can’t let the game consume him. Realising that “the game” is more than just what goes on inside the ropes is the next step. Rory McIlroy might be a former world No 1 but he refuses to come to terms with the scrutiny into his private life and business dealings that comes with his vaunted position in the game. It was almost fitting that he ended the season with a listless bogey at Sherwood Country Club near Los Angeles, where he finished an anonymous 11th in what was a thrilling final edition of the Northwestern Mutual World Challenge before it leaves Sherwood Country Club and moves to Isleworth in Florida.